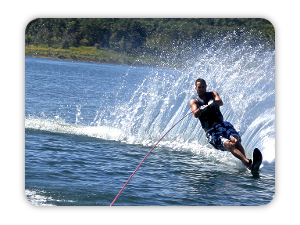 Area water sports include water skiing, tubing, knee boarding, wake boarding, swimming or just a leisurely boat ride at sunrise or sunset. Water skiing and tubing is fantastic due to the open waters and many large coves. Scuba Diving and Snorkeling is also a favorite past time on Bull shoals. With deep clear water, this is a great place to renew your skills before taking that salt water trip. Bull Shoals Lake is a Corp of Engineers Lake that allows public access to all its gravel bars and bluffs, either by car or boat. A great place for that Ozark shore lunch. (Please anchor your boat out away from shore, fiber glass and rocks do not mix). The Pontiac area includes fishing for Large Mouth Bass, Spotted Bass, Small Mouth Bass, Crappie, Walleye, Stripers, and Catfish. 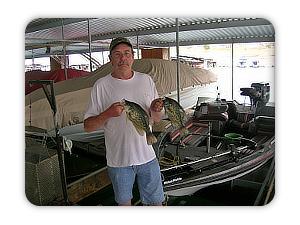 Fishing on Bull Shoals is a year round activity, with some of the largest fish being caught in the middle of winter. You might even have the whole lake to yourself. Spring and fall is always a good time as with many other lakes. In the heat of the summer, either fishing for deep walleyes during the day, or night fishing for bass on deep cover can provide you with great memories. The White River is a short distance from your cabin, and is home to some of the worlds finest trout fishing. This is the tail water from Bull Shoals and it is cold and clear.